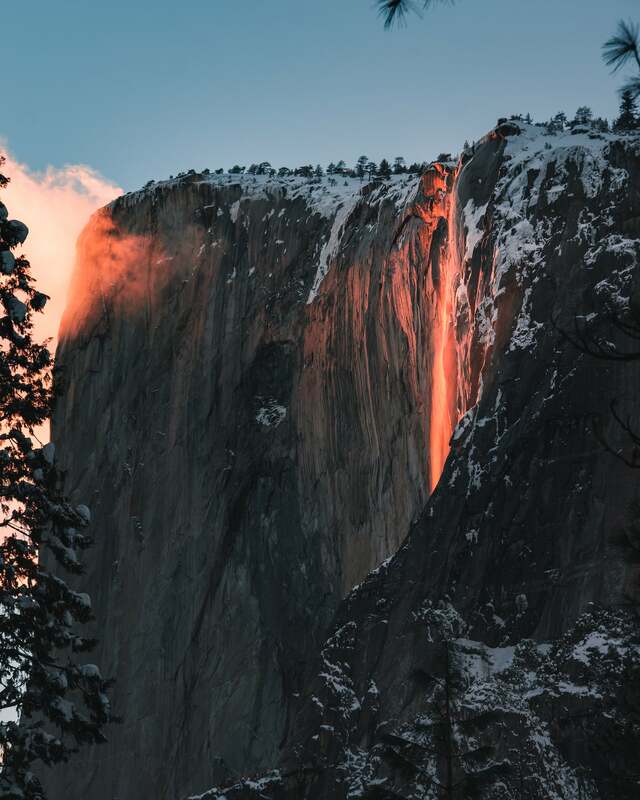 Each year, there’s a week-long period when Horsetail Fall in Yosemite National Park comes alive with a glow that resembles lava flowing off the face of El Capitan. 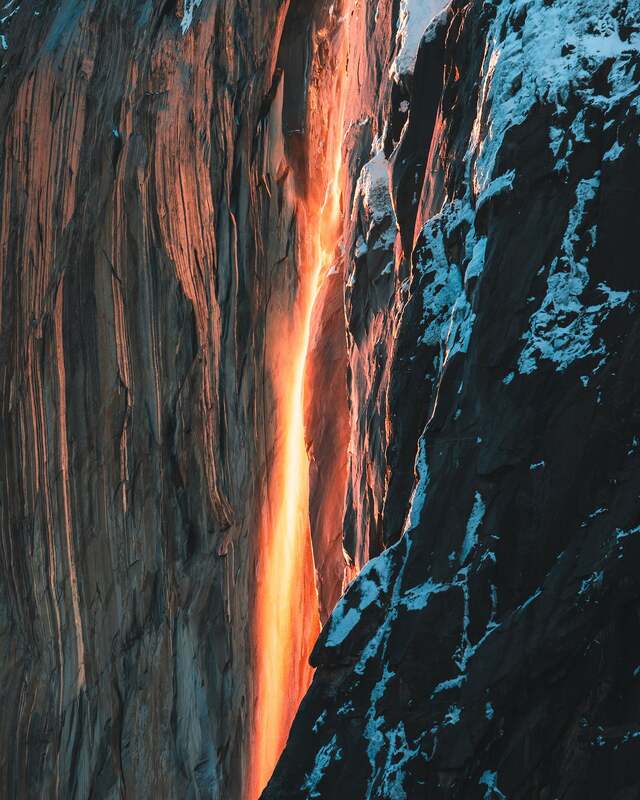 This “firefall” was made famous by Galen Rowell, who spotted and captured the effect in the park in 1973. Since then, it has become one of the most iconic photos of Yosemite and an event that photographer’s dream of and many travel to capture. I was lucky enough to be able to capture the event this year, but not without preparation, the right gear and plenty of factors going my way. Here’s a little more about how I photographed this year’s firefall in Yosemite National Park. If you want to capture firefall, you’ll want to head to a spot at least 1-2 hours before sunset. We began looking for parking just after 3 p.m. and there were no spots closer than a mile away from the viewing areas. Plan on at least a 20-25 minute walk from where you park followed by a long wait in the cold before you can capture the event. Blankets and a chair will make the waiting game much better. I walked along Northside Dr. near the El Capitan picnic area until I found a clear view between the tall trees. 1. 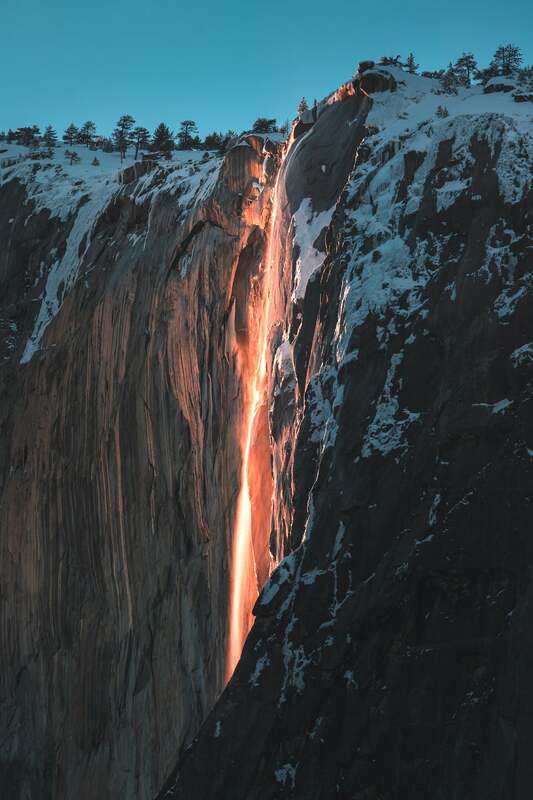 Water flow – Horsetail Fall is dependent on warmer temperatures melting snowfall from earlier in the season. This season there’s been unusually freezing temperatures which has slowed the flow of the waterfall. Despite the reduced flow, the surrounding snow from the recent storms has left the park resembling a winter wonderland. 2. Clear skies – When I’m chasing sunsets, I’m always hoping for clouds to light up the sky and add some depth. This is one of the few times where you’re hoping for clear skies because this show is dependent on having a clear horizon to the west. If there’s cloud coverage to the West, chances are the last light will be blocked and the effect won’t happen. 3. Wind– Horsetail Fall is sometimes hard to spot. The “Firefall” effect is really amplified by the misting of the waterfall. Ideally you have a lot of water flow and this isn’t needed, but a bit of wind can really help the neon glow come to life. Having a zoom lens is essential to getting this shot. Horsetail Fall is high up near the peak of El Capitan and is challenging to see with the naked eye. I used the Sony 70-200mm f/2.8 G Master lens to punch in and get detail on the glow. You can shoot handheld with this fast lens, but having a tripod helps a lot since the effect happens in low light as the sun is setting. The Sony α7R III is incredible in low light so paired with the f/2.8 aperture on the lens, it was the perfect duo for me. I also have Super-35 mode assigned to a hot key, so I was able to punch in and get even more compression on the waterfall for a composition. This event is a can’t miss experience for every photographer. Despite the crowds, it’s definitely worth making the drive into the park and adding the shot to your portfolio! 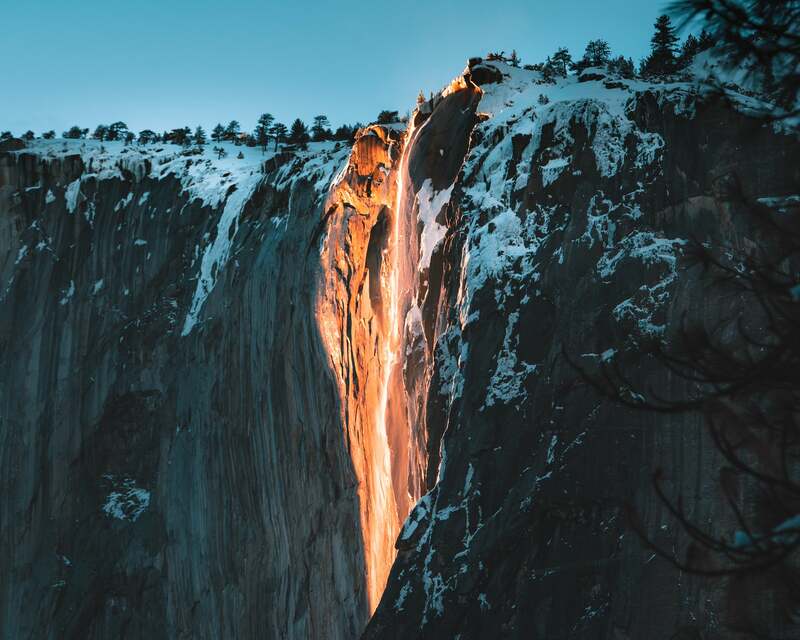 Yosemite is beautiful in every season, but firefall really makes winter one of the best times to visit. Eric Rubens is a member of the Sony Alpha Imaging Collective. Follow all of their adventures on Instagram https://www.instagram.com/erubes1/.